0.039" (1mm) dia x 0.020" (0.50mm) thick. 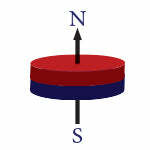 N52 Rare Earth Neodymium Disc Magnet, magnetized through the thickness. Nickel Plated. Our Micro Magnets are defined as a tiny neodymium magnet with a diameter equal to or less than 0.039" (1mm). The size of the diameter of a disc magnet has a direct impact on the holding force, pull force, and magnetic field profile. Small magnets, such as Micro Magnets are predominately used as sensor magnets, medical device magnets, craft magnets, consumer electronics magnets, and applications that require a low holding or pull force.